Tanks. So, who doesn’t like tanks? No one, that’s who! Because tanks are awesome. Same goes for co-operative gaming, in which teamwork is vital for success. There’s just something special about couch-gaming. Maybe it’s that you can reach out and smack someone if they’re not doing a good enough job, or the opposite if they just saved the entire team. You don’t get that playing online – whether you’re all in tanks or not, is entirely irrelevant. Anyway, enough rambling. Tankwork drops up to two people into customizable, upgradeable (…but do they make coffee?) 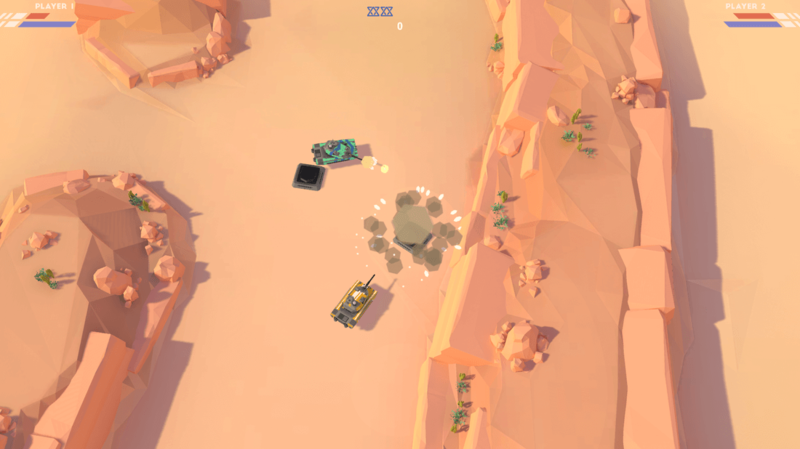 tanks, in a big battle against a robot uprising. Not that I, personally, need an excuse to jump into a 60-ton mobile weapon of destruction, but if robots must die, then robots must die. According to the developer, it’ll be a tough-as-nails battle against a nice handful of different machines, each with their own weapon as well as specific tactics required to take them down. Even for a tank. Oh and watch out for Rosie. Trust me. So to recap: top-down, 1-2 players, tanks vs. robots, explosions, customization, upgrades, tanks, explosions, more robots. And more robots. Sounds good? Great, because the game’s in dire need of either your money, vocal support (spreading its Kickstarter campaign), or both if you’re feeling truly generous. Part of the reason for attempting to crowdfund its development is to avoid publisher involvement, but I have a feeling that whole “the more support we receive, the more we will be able to afford” bit is a bigger deal, honestly. More game, more variety, more explosions, more robots and so on – definitely wouldn’t be a bad thing! Here’s the thing though: at the time of writing, Tankwork is only at $1,500 of $10,000. Not even remotely close to the goal. Fortunately, there’s still plenty time left too, as it has until December 16 2015 to wrap everything up. Shouldn’t be too challenging, ya know? Need some incentive? Alright: $10 gets ya a digital copy of the game, come December 2016 (note: Windows only), while more lucrative stuff like “hand signed print of game art” will set you back $50. Every little thing helps, including shoutouts across social media – no need to bust out that fancy credit card if ya don’t want to. Just saying.